Welcome to Day 2 of the Portfolio Dress Sew Along hosted by Gwenny Penny and Pickup Some Creativity! If you are just joining us, click here for Day 1 of the sew along. By the end of today you will see some major progress on your dress. Don't forget to join our Flickr group so you can share your dress with everyone. To start off today, head on over to Pickup Some Creativity for Steps 6 through 10 with Chris. Then come back over here to Gwenny Penny for Steps 13 through 16. 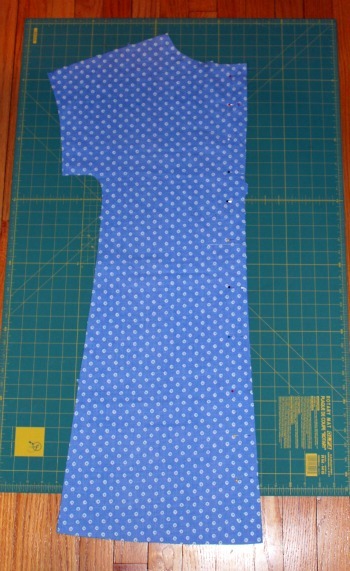 Take both of your back pieces of fabric (piece 5) and pin them right sides together, matching up notches. 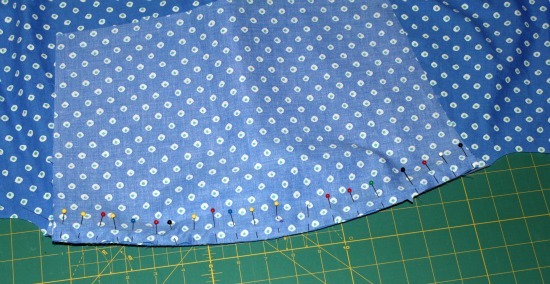 Sew from the bottom edge all the way up to the large dot using a 5/8" seam allowance. Make sure you backstitch at the large dot. Now you need to hem the raw edges above the large dot. Fold these raw edges under 5/8" toward the wrong side of the fabric. Press. Take the raw edges and tuck them under to the crease that you just pressed. Press again. 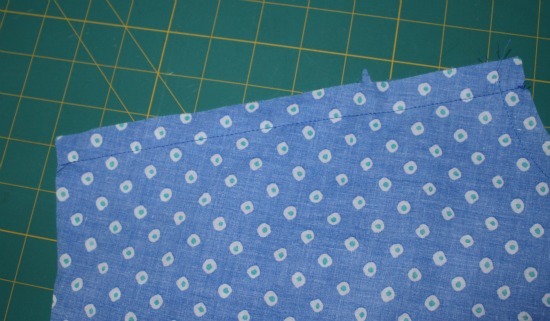 Stitch around this newly formed hem about 1/8" from the edges, squaring off across the bottom at the large dot. I stitched over the large dot a couple of times to reinforce it. Below the large dot, press the seam open. 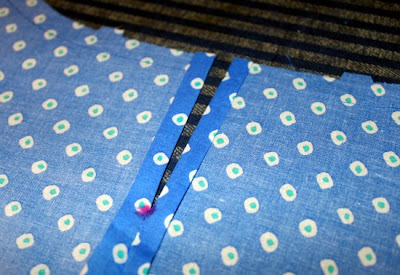 Finish the seam using your preferred method (see Chris’s post today for more information on finishing seams). Take your front piece (piece 3) and your back piece (piece 5) and pin them right sides together, matching up notches. 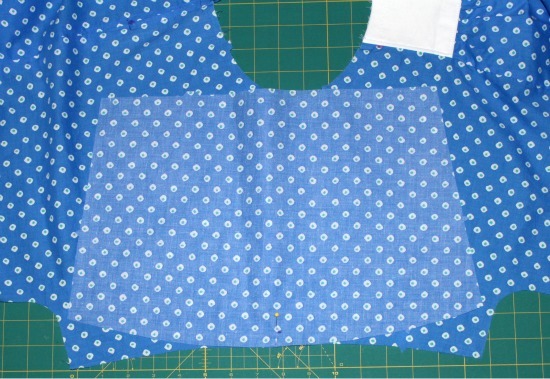 Sew along both the right and left shoulder seams using a 5/8" seam allowance. Finish the seams using your preferred method (see Chris’s post on finishing seams for more information). This process is a little counterintuitive, and people sometimes have trouble lining up sleeves and necklines because the pieces don’t follow the same curve when you pin them together. Start by opening up your dress front/back. 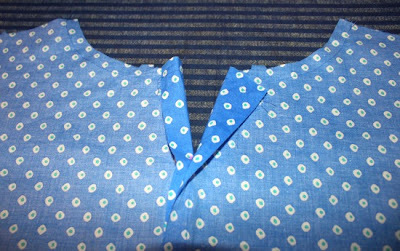 Lay it down right side up and sideways so that the armhole is facing you. There is one notch in the armhole area. This will help you determine which sleeve (piece 9) to use on this side of your dress. Take one sleeve (piece 9) and lay it out wrong side up on top of the armhole. The small dot on the sleeve should be at the bottom. 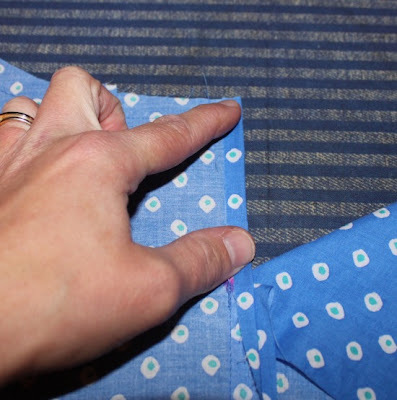 If the notch on the sleeve is on the same side as the notch on the armhole, you have the correct sleeve. 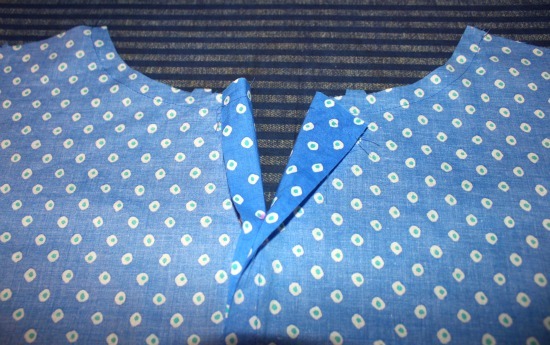 If the notches are on opposite sides, switch to the other sleeve piece 9. Line up the edge of the sleeve piece that is closest to the small dot with the raw edge of the armhole. 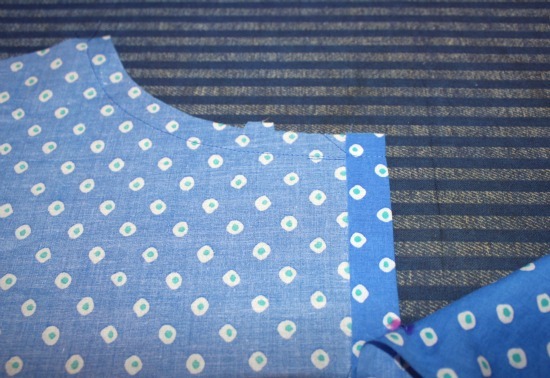 Make sure that the small dot on the sleeve piece is sitting directly on the shoulder seam of the armhole. 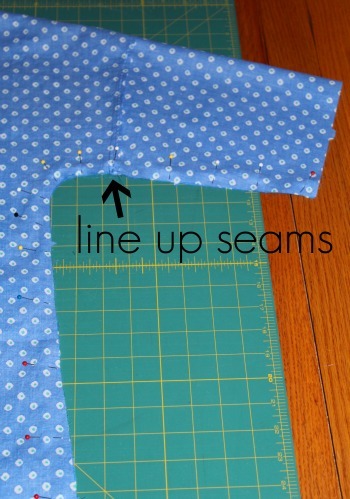 Pin the two pieces together right at the dot/seam. Now, begin to ease the fabric around to the right side of the pin, pinning every inch to inch and a half, lining up the sleeve with the raw edge of the armhole. Do the same thing around to the left side of the pin. It may not look like it before you pin it, but the two pieces will fit together perfectly. Don’t be afraid to use lots of pins! It’s really important for this part, so take the time to do it. 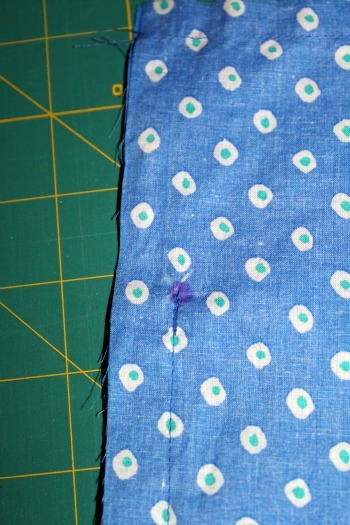 Carefully stitch around using a 5/8" seam allowance. Go slowly and pay attention so that the rest of your dress fabric doesn’t get caught up in your seam (I speak from experience). Press the seam toward the sleeve. Finish the seam using your preferred method (see Chris’s post on finishing seams for more information). Repeat Step 15 for the other armhole/sleeve. With your dress wrong side out (right sides together), align your armhole seams and pin together. Pin the rest of the underarm area together, matching up notches. 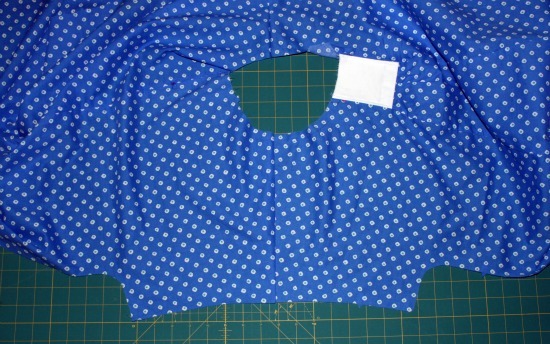 Sew the entire underarm area from the end of the sleeve to the bottom of the dress using a 5/8" seam allowance. Finish the seam using your preferred method (see Chris’s post on finishing seams for more information). Repeat Step 16 for the other underarm seam. You have an actual dress now! Soon you will add a neck band, sleeve bands, and a few finishing details. Come back tomorrow for Steps 17 though 19 here on Gwenny Penny and Steps 25 through 27 with Chris over on Pickup Some Creativity. Again, if you have any questions, tips, or comments, please leave them in the comments section below so that everyone can benefit from the discussion. Thanks for sewing along! Great directions! I can't wait to check out the flickr group to see all the variations of the same dress! 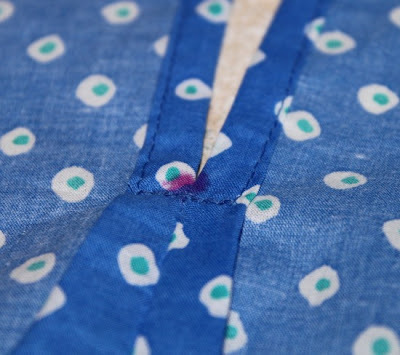 Even though I'm not making the dress, I'm learning some great tips for sewing clothing! Thanks ladies! It's coming along great, Gwen. I'm not sewing the dress either but it is fun to follow along and learn something too! Hello again! I am making my second of these (using view B, but making it longer) and have fabric for a third one for winter. For my next two, I'm using (first) embroidered linen and (second) corduroy. I'm pretty much a "sew it as written" type of person, but I'm looking at my bumpy/heavy fabric and wondering if I could/should use a lighter fabric for the facing of the neckline and the pocket section. Any opinion? I love the idea of a hidden contrast (if that makes sense), but am a little concerned that difference in weight might lead to issues. I'd value your input! Thanks! Just a quick follow up on my different lining question. I found some material that's a reasonable match, just moldering away in my stash, so I am going to try it out.I figure I can always use my seam ripper if it doesn't play nice with my heavier fabric! @knitme23 - Sorry it took me a few days to respond. I've been away on vacation. I don't think it will be a problem to use a lighter fabric for the facing. It would certainly be easier to sew a lighter weight fabric to the heavier weight than to double up on heavy weight. I'll be interested to hear how things go.